Google’s planned acquisition of ITA Software’s flight information search engine, called Matrix Airfare Search, is creating quite a buzz, and a near desperate push back from Google’s competitors such as Microsoft. 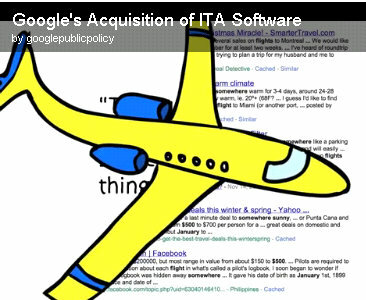 The problem, as opponents see it, is that Google will have an unfair advantage in the flight search information space if it is allowed to acquire ITA Software for it’s current price tag of $700 million. However, according to Google, the acquisition will NOT create an unfair competitive market because, as Google puts it, they do not directly sell airline tickets and would only be helping the consumer find cheaper air fare on flights. Microsoft of course, because since they can’t actually create something that people (the market) enjoys and finds useful, they have to spend their time, money, and effort, trying to suppress other companies from doing the same. So can someone please tell me when Microsoft CEO Steve Ballmer is going to get fired? How can the board see him as a good choice for Microsoft? Anyway, here’s a quick video Google put together to give you more information about their desired acquisition of ITA Software.